Who needs Spring cleaning? How about Spring decorating?! One Kings Lane is welcoming in Spring with a sales event that will help you breath new life into every space in your home. Each day this week One Kings Lane is featuring fresh ideas and beautiful furnishings up to 70% off retail in their 5 Rooms in Five Days. Check out entire looks for spaces from furnishings, wall decor, floor coverings, and more--everything you need to spruce up your home this Spring. 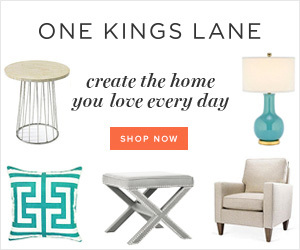 If you're new to One Kings Lane, sign up today for a $15 credit for purchases of $30 or more. This amazing sale is going on right now through Friday, so head over to One Kings Lane before it's over!